Link parameters with other columns of same table or other table using relations. Parameters can be linked with cells in the same row or with cells in other rows using relations. So a computed cell knows where to get parameter values when calculating. On the other hand, each cell knows whitch computed cells have to be recomputed when updating its value. Between the computed cell and the source cell may be relation steps. The link specification is called Access Path. Access Path always starts at the computed cell then it may go to other rows via Relation Steps and ends with a Column Step. Using All Rows ("*") is faster than Distinct Rows ("%"). 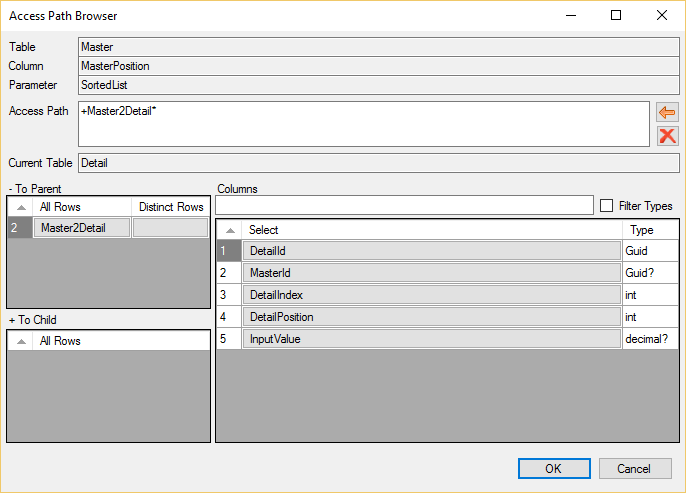 Parameter will take its input from same row in column "Column42"
To obtain input parameter takes parent row via relation named "RelationMaster2Detail". There it will take its input from parent row and column "Name"
The "-" symbol indicates the relation will be passed from child to parent (from many to one). The "%" symbol says take distinct rows only. To obtain input parameter takes child rows via relation named "RelationMaster2Detail". There it will take its input from child rows and column "Price"
The "+" symbol indicates the relation will be passed from parent to child (from one to many). In case of any "to many" access in access path, the parameter value will be an array with one dimension. The "*" symbol says take all rows (not distinct rows only). The table where access path starts. Removes the last step from access path. Table from where the access path starts. Object that carries the function. Name of table after last relation step in access path. Relations where current table is child. Clicking a relation name will add the relation step and relations parent table will be current. Relations where current table is parent. Clicking a relation name will add the relation step and relations child table will be current. Column names of current table. Clicking a name will add the final column step to access path and close the dialog. Filters columns on expected type.